Ezra Miller’s Flash is probably going to be one of the parts of Justice League fans and audiences enjoy the most. He’s got a few laugh lines in the trailer, and he’ll probably serve as the lovable, fast-talking comic relief, which DC and Warner Bros. seem to realize they are very much in need of. Today, a brand new image of Miller as Barry Allen in his Flash Cave debuted online, and there are a few fun little details you might miss unless you inspect it closely. A plaid hoodie-clad Allen stands in the middle of his workspace, which has bits and bobs strewn all over and a general sense of that-kid-in-your-high-school-class-who-told-everyone-he-learned-Linux-in-a-week. Keep an eye on those screens. One of these things is not like the others. Yep, looks like Flash is a Rick and Morty fan. 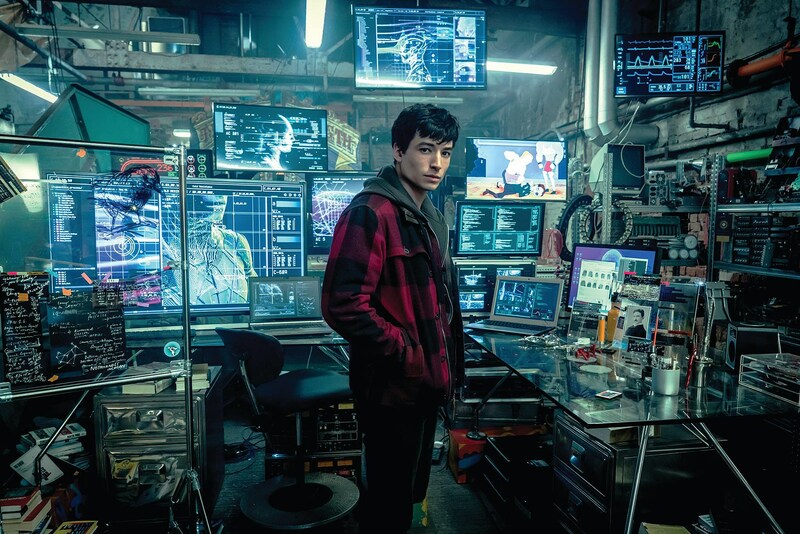 Not only that, on a computer screen below, it looks like he’s got a copy of some fingerprints — Barry Allen was a bit of an amateur detective himself. And next to that is a photo of Nikola Tesla, father of modern electricity, who probably inspired Allen in his research into the Speed Force. All the rest of his research looks like designs for the perfect aerodynamic suit. There are probably a lot of tiny details I’ve missed here, like book titles and that bird drawing and what might be a Bungie Fist sticker there on the left. But the set looks very cool, and, again, I’m fully prepared to like the Flash a lot in this movie. He seems like the jolt of fun energy the Justice League needs right now.